Who is the one player that stands out to each of you as someone who’ll undoubtedly go in the first round and is highly regarded by most respected football personalities, that you feel has ‘bust’ written all over him? Is there more than one, in your opinion? For me, there seems to be one in every draft, if not a few. Darrius Heyward-Bey, Dion Jordan, Kevin White. Those were a few guys that I was never high on. I would have added Artie Burns, but it was more of a surprise that Pittsburgh took him that high. I don’t remember the ‘General Consensus’ being that he’d go that high. Oh, Darren Lee was another one I think. I think many people will say DK Metcalf, but I see his floor as being an Alshon Jeffrey type. Most receivers I want to criticize aren't surefire first round picks. Hollywood Brown and N'Keal Harry are overhyped in my opinion. 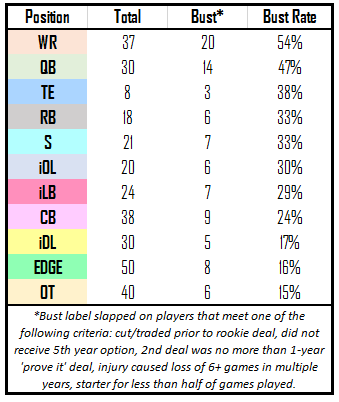 Somebody posted a study on draft busts by position recently. Very relevant to this thread, wish I could find it. The takeaway, from what i remember was least likely to bust: edge rushers and linemen. Most likely: QBs and WR. I think most non nfl people agree on this but, goodness gracious, if Daniel Jones touches the first round, I know nothing about football. This one. The guy looks awesome in pads, and has the strength/speed you look for, but that awful cone drill. He's too stiff to make it in the NFL I think. The QBs are automatic. Chances are 50/50 on them. I think Murray has the highest floor but it's quite possible none of them work out. So add all of them, including Daniel Jones who you figure someone will sneak into late round 1 for. Drew Lock. Long, slow release with a dip in his arm. Did not fare well against SEC competition. Dwayne Haskins. I just hope he ends up on the Bengals. Drew Lock looks so much better to me. I honestly don't understand the faith in Haskins by the media. Brian Burns would worry me. He's one of these guys who is a 1st round pick based on projections that he's going to change. That's dangerous. He's really skinny and not in a Jason Taylor way. I don't see any strength. Everything is an outside move and quickness. In the NFL you have to shed blockers. The reports all talk about him putting on weight. The way his frame is it would have to be significant. I'd be real leery about taking Brian Burns in round 1.